Rockstar Energy Racing entered round 2 of the Supercross season in Phoenix with the red plate for the second consecutive year, and left still holding it in similar fashion. Only this time it was in the 250 class while en route to the second victory in a row. 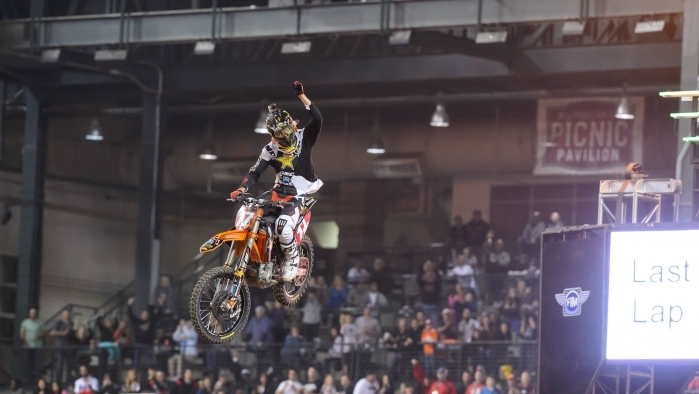 The repeat win in this young season for Jason Anderson came very dramatically on the last lap not unlike the opener last weekend in Anaheim. Jason Anderson is clearly at the top of his game and is continuing to prove that consistently throughout each race day thus far. Winning round one does not always get the respect it deserves with skeptics making opinions built heavily on the adversity that A1 presents. Everyone on the line is expected to be a bit rusty and nervous and some riders may not have even seen a gate drop since August; the last round of the Outdoor Nationals. Phoenix could possibly be considered the complete opposite and maybe even one of the least pressure race situations of the SX season, that is unless you are the points leader. In that case you must prove your trip to the top of the box was not a fluke. Anderson made that very clear. In the second qualifying practice of the day, Jason was entrenched in a very intense battle of times with a few other riders. Then on the final lap he put up an incredible time, earning the fastest 250 lap of the day. He then reeled off another start to finish heat race win in impressive form. What happened next was nearly a 15 lap carbon copy of the week before. Cole Seely, with Anderson in tow simply walked away from the other 20 riders in the field, and just like before, the two leaders remained very close for the entire affair. Once again the #17 made the last lap pass for the Rockstar Energy Racing team, keeping the red plate and extending his points lead going into round 3. Jason Anderson: "You know what I'm going to say huh? That I only lost first practice! (laughs). Today was good. I had good practice times and had a good heat race. I struggled with one rhythm section pretty bad but made it work in the main. It definitely made things interesting and I made another last lap pass." Ivan Tedesco made vast improvements in the 7 days since he made his return to professional Supercross racing. He was much better throughout the entire day in practice and qualifying. Tedesco has been working hard during the week to get his endurance up enough to be strong for 20 laps. He is getting closer on the practice track, but in no way can that compare to the intensity and fatigue produced in a full 450 SX main. The only way to get into true racing form is to race, and Ivan is doing just that. While his result at A1 was hampered by damage to the bike cause by another rider, his improvement to finish 12th was still very impressive. Trying to ride through fatigue and deal with some of the toughest whoops seen in a while is a major accomplishment. IT will still need some time to get back to where he knows he can be, but he is progressing rapidly. Ivan Tedesco: "Today was a lot better. A lot better than last weekend. In practice I qualified 14th and I was 22nd in Anaheim. Improving every week , in the main I ended up 12th. I got a little tired in the main but my fitness, I obviously can't expect it to be there after only working at it for a month. I'm going to keep working at it, building and hopefully get better every week and by the end be up there." Not unlike Ivan, Cole Thompson came into his first race a little out of sorts. Cole has also not been in a serious racing situation for some time. He also has only been on the bike and working with the team for just a little over a week. However, Thompson is ecstatic and states that the RER KTM 350 is the best bike he has ever ridden. He was definitely a bit rusty in the first practice, but by the 3rd and final session he had the tough sections and the whoops much more dialed. Although he didn't make the tough 450 main, he did get three races under his belt with the heat, the recently reinserted to the program semi qualifier and finally the LCQ. He will head into the next event with much more confidence after his Arizona experience. Cole Thompson: I learned so much this weekend and made good improvements throughout the day. I just need to get more comfortable racing again. Thanks to my team for helping me to improve and working hard to give me an awesome bike. I'm looking forward to getting ready for Anaheim 2." Anderson will make the trip back to Anaheim attempting to win his 3rd consecutive race and extend his points lead. Tedesco and Thompson will look to forge ahead on their progression. Davi Millsaps continues to rehab his injured knee.